Backing up sites are essential, but not all sites have essential data that need backing up, so you can exclude directories from your site(s), so when you start a manual backup or an automatic backup is run, it will not include the specified directory. 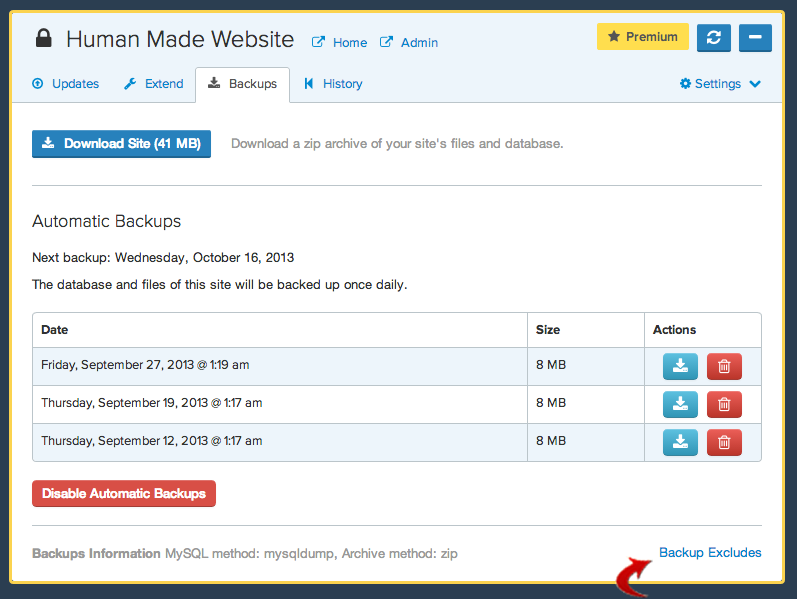 To begin excluding directories, goto the backups tab of the selected site. You’ll be able to see at the bottom of the panel, the backup excludes button. The backup excludes panel will expand. There are two exclude locations added by default, .git/ and .svn/ which are hidden folders created by version control software. If you don’t know what these are, don’t worry about them. In this field you can begin adding the paths to folders you would like to exclude. Example below. Will match all .git directories including those in subdirectories. You can also specify wildcards by adding an asterisk to your search pattern. In this example we’re doing a search for a folder that has anything followed by -cache. If you have any issues, please don’t hesitate to contact support at [email protected].